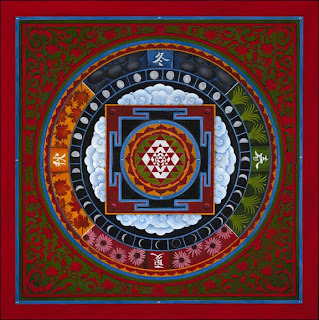 At the center of the mandala is a Hindu ‘Shri Yantra.’ This represents the union between the masculine and feminine. The Sri Yantra is a configuration of nine interlacing triangles centered around the bindu (center), drawn by the super imposition of five downward pointing triangles, representing Shakti; the female principle and four upright triangles, representing Shiva; the male principle. The nine triangles also represent the spiritual journey from the material realm to ultimate enlightenment. I was drawn to this symbol for you as it brings together in union your bold, masculine nature (as you spoke of with me) with those feminine aspects of yourself—compassionate heart, relationality, generosity, and healer. The center of the mandala symbolizes the cosmos, the union with the divine (enoughness), which is then held by the cycles of the moon (31 days to represent your birth month) and nature (where you feel closest to God) and the cycles of the seasons. The four Japanese characters read as the cycles of the seasons. To the North is Winter. To the East is Spring (daffodils). To the South is Summer (echinacea). To the West is Fall. Framing the mandala, I was drawn to the bright red and green from the Japanese culture which represents your ancestral line and wisdom. The lotus pattern a reminder of death, rebirth, and healing. When you meditate with this mandala, my hope is that you will know that you are more than enough and whole. You are one with all creation and a gift to us all. Mandala is sanskrit for circle. The mandala has long been a vehicle for healing and meditation in many spiritual traditions including Native American and Tibetan sand paintings. In Christianity, the twelfth-century abbess and visionary Hildegard of Bingen often expressed her illuminations of God through mandala paintings. A mandala represents wholeness and can be seen as a cosmic diagram that reminds us of our connection to the Divine, or God, as well as our interconnectedness in the web of life. In this way, mandalas are an expression of the Sacred that is both immanent and transcendent.